Join in on all the wacky fun that the Jack in the Box has in store for you. Click here to play! Play with this crazy jester and you might find yourself amassing a fortune! The Jester is the star of this show. He lives inside the jack in the box and will spring out to give you the highest payout of the game if you can spin three of him across the single payline. You’ll also want to look out for the lucky seven. These colorful blocks have a top payout of 200 coins if you can spin three of them across the payline. And, like all 3 reel games, you’ll find triple, double, and single BAR symbols to help you in your quest for cash. Don’t forget the cherries! These sweet fruits will bring in up to 20 coins if you can collect three of them. Keep in mind that the Jester is also a wild symbol. Not only will he replace all other symbols to help you create more wins, but he will also multiply your winnings when he appears in a winning combination. 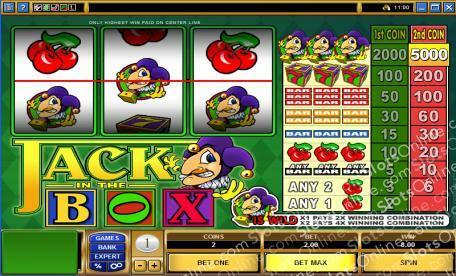 So, join the Jester in this crazy Jack in the Box adventure and you could walk away with plenty of cold, hard cash! The Jester is a wild symbol. He will replace all other symbols to help you bring in more wins. It will also multiply your winnings by 2 or 4 if you spin him in a winning line.